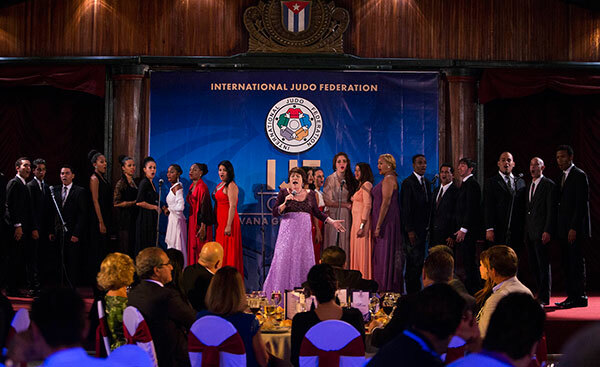 The heavy morning rain refreshed the Havana atmosphere, while the first event of the year, the Havana Grand Prix 2016, Cuba, opened the doors of the IJF World Judo Tour 2016. A new season is opening for athletes from around the world, a season that will bring its share of immense joys and inconsolable disappointments whereas years of training will find a conclusion in a few months from now in Rio de Janeiro. With two gold medals and one bronze medal obtained on the occasion of the first day of competition in Cuba, Brazil showed that step-by-step, all watches will be put at the Brazilian time. But the concurrence is going to be very high in Rio next summer. 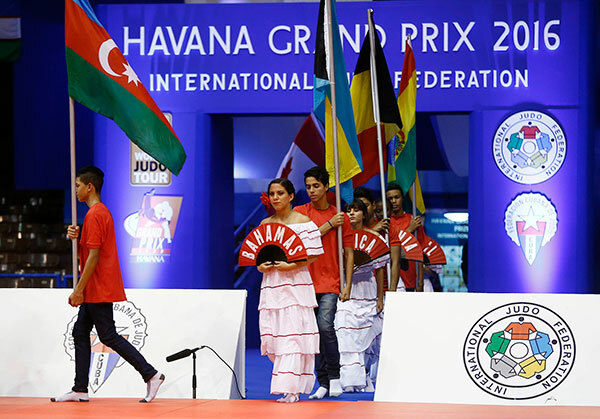 Pending the Rio 2016 Olympic gathering, from 9:00am this morning, all eyes were on the two fighting areas of the Sports City Coliseum in Havana, where 388 competitors from 66 countries will compete for the title of champion of the second edition of Havana Grand Prix, over the next three days. For this first day of competition, 128 athletes were engaged in the women’s -48kg, -52kg and -57kg categories and the men’s -60kg and -66kg divisions. 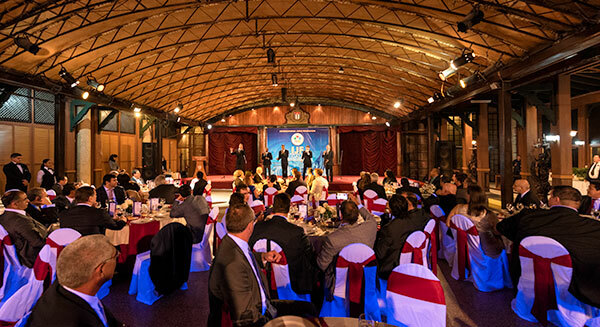 The opening ceremony of the Grand Prix started just before the final block with a performance by famous Romanian singer, Marcel Pavel. This was just before the delegations entered the stadium and the Cuban anthem was played. To conclude the opening ceremony a cultural program was proposed to the numerous audience. The cultural programme featured several great national and international artists. 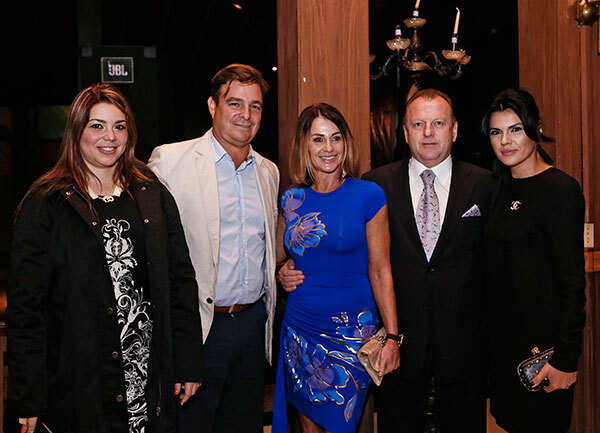 Among them was Marcel Pavel, who already sang during the opening ceremony of the event and who once again entertained the audience with some of the greatest classic songs of the repertoire. The Academy of Singing Mariana de Gonich was also present on stage together with Ms. Zenaida Armenteros, Queen of Cuban folklore, and Mrs. Maria Eugenia Barrios, soprano, Glory of the Cuban Culture. Click here to view the ongoing Rio 2016 Olympic qualification list. The most awaited athlete of the day in the women’s -48kg category was without any doubt the Argentinian and current world champion, Paula PARETO, who came back to competition today with a brand new red back number. If her first fight went very well as she defeated Amelie ROSSENEU (ISR) by ippon, PARETO, her route was blocked by the world number 20 and World Masters 2013 bronze medallist, Dayaris MESTRE ALVAREZ (CUB), who definitely benefited from the support of her home crowd to achieve such a performance. In the absence of PARETO in the final, the current Olympic champion, who looks to be on an ascendant slope towards Rio 2016, entered the final to face Shira RISHONY (ISR), whose best result last year was a bronze medal at the Paris Grand Slam. But knowing that the Paris Grand Slam in 2015 was in October, this clearly shows that RISHONY also follows a positive ascension. After 37 seconds in the final, both athletes were penalised with a first shido for passivity. But it did not take long for MENEZES to launch a beautiful drop-seoi-nage for a clear and perfect ippon. MENEZES looks in good shape at the beginning of this season and after her Olympic title in London and two difficult following years, she is back on track to defend her title in her home country in August. 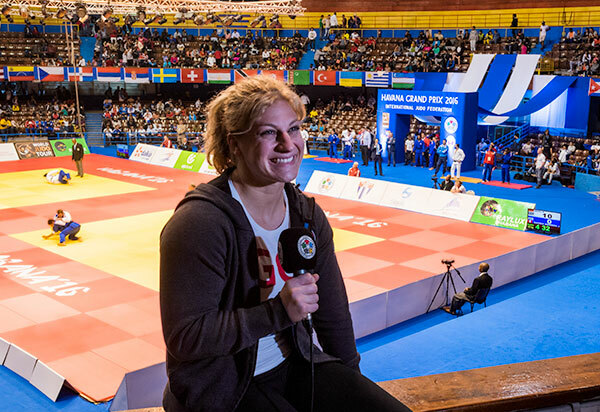 After her disillusion during the preliminary rounds, Paula PARETO did not fail against her second Cuban opponent of the day as she defeated Yanisleidi PONCIANO by ippon. To step onto the podium, she was opposed to a third Cuban athlete, Melissa HURTADO MUNOZ. HURTADO MUNOZ immediately put her strong right arm over PARETO’s head, but that did not bother the world champion, who scored a first superb waza-ari, with a drop seoi-nage with only one sleeve. But PARETO’s second attack was not precise enough, and the Cuban could counter-attack for a yuko. Stil behind, HURTADO MUNOZ launched a strong sumi-gaeshi, which make the public react, but for no score. With less than a minute to go, the Argentinian launched a last drop seoi-nage for ippon this time. The second bronze medal fight opposed Laetitia PAYET (FRA), who earlier defeated world number 9, Taciana LIMA-BALDE (GBS), during the preliminary rounds and Dayaris MESTRE ALVAREZ (CUB). After three minutes, only one penalty was given to the French who could not find the solution against the Cuban. This shido was enough to give the victory and first medal to the Cuban delegation. 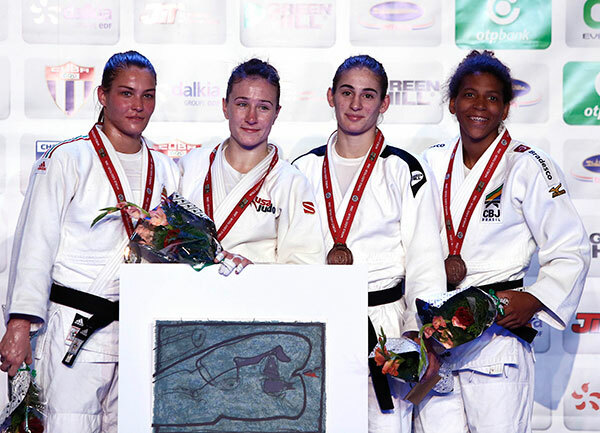 Mareen KRAEH (GER), bronze medalist on the occasion of the 2013 World Championships in Rio, was the top seeded athlete of the category and with no surprise entered the final after having successively defeated Ecaterina GUICA (CAN), Evelyne TSCHOPP (SUI) and Joana AMOS (POR). In the final she was opposed to the veteran of the competition, Ilse HEYLEN. The 38-year-old Belgium athlete showed once again that she has an incredible fighting spirit. In the final, Ilse HEYLEN was rapidly thrown by Mareen KRAEK for waza-ari followed by an immobilisation for ippon. Nevertheless, HEYLEN’s performance is remarkable and the gold medal of KRAEH is well deserved. 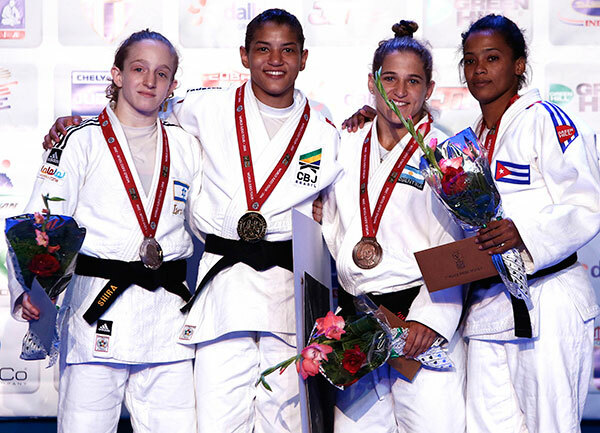 The first bronze medal fight opposed Gretel ROMERO (CUB) and Odette GIUFFRIDA (ITA). Both athletes having been penalised with a shido, looked ready to fight into the golden score when GIUFFRIDA found a small opportunity with an opportunist ko-uchi-gari for yuko and for a medal. In the second bronze medal contest, ADIYASAMBUU Tsolmon (MGL) faced Joana RAMOS (POR). After having scored a first yuko, Ramos was then penalised for escaping out of the fighting area. More active than her opponent, the Mongolian was finally able to throw RAMOS with a kata-guruma for waza-ari, which the Portuguese replied also with a waza-ari. But that did not intimidate ADIYASAMBUU, who, with the same technique (kata-guruma) scored another yuko, which was revised as an ippon. In the women’s -57kg, once again the top seeded athlete, Marti MALLOY (USA) confirmed her position and entered the final after having defeated the 2013 World Champion Rafaela SILVA (BRA) in the semi-final. In the final she was opposed to world number nine and European Games silver medallist KARAKAS Hedvig (HUN) who produced one of the most beautiful ippons of the day in the semi-final when she executed a perfect ashi-waza technique within a few seconds against Viola WAECHTER (GER). During the four minutes of regular time, both champions perfectly neutralised each other and were not capable of scoring. 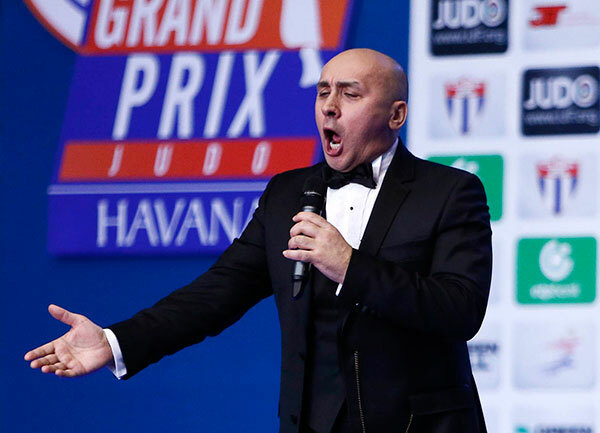 The same scenario took place during the golden score as the referee had to wait more than three minutes to give a first shido to KARAKAS, offering the victory to the American. 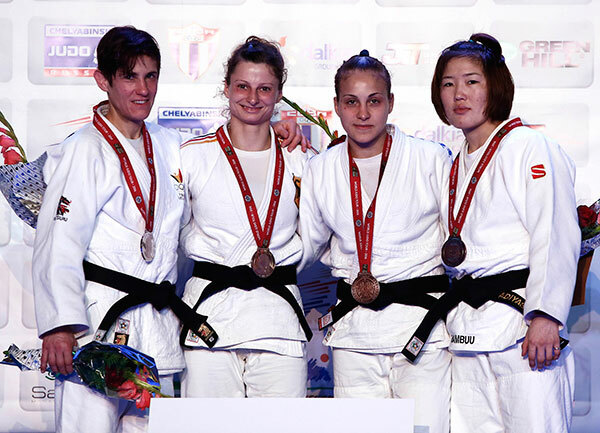 The first bronze medal fights opposed Nora GJAKOVA (IJF) and Viola WAECHTER (GER). The first score came from Nora GJAKOVA, who with an ample o-uchi-gari took the lead with a waza-ari. This was enough to give her the victory and the bronze medal. In the second bronze medal fight, Catherine BEAUCHEMIN-PINARD (CAN) opposed Rafaela SILVA (BRA). Visibly dominated by the strong grip of her opponent, SILVA seemed incapable of accelerating. But she could count on a small mistake from the Canadian to throw her with a counterattack for waza-ari. If in -48kg MENEZES looks back on top of her form, this is not yet the case for SILVA, but the way to Rio is still full of opportunities and for sure the 2013 World Champion will do her best to run for gold in her home country on the occasion of the upcoming Olympic Games. 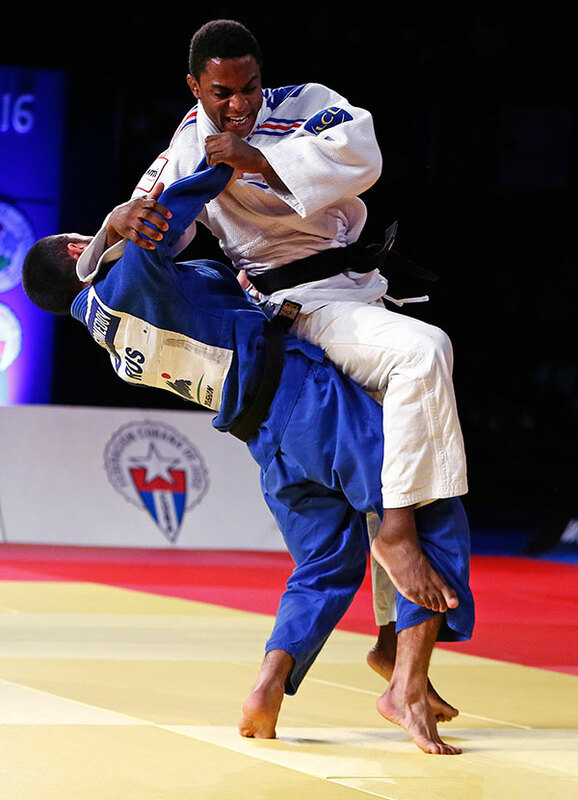 The final of the day in the men’s -60kg category opposed the 2015 Pan-American silver medallist, Eric TAKABATAKE (BRA) and Bekir OZLU (TUR), who was not among the favorites of the competition but who showed beautiful and opportunist judo throughout the day. Due to an injury, Bekir OZLU (TUR) could not compete and Eric TAKABATAKE won the second gold medal of the day for Brazil. With Ahmet Sahin KABA (TUR), Turkey placed a second athlete in the final block. For the bronze medal, he was opposed to Armenian Hovhannes DAVTYAN. 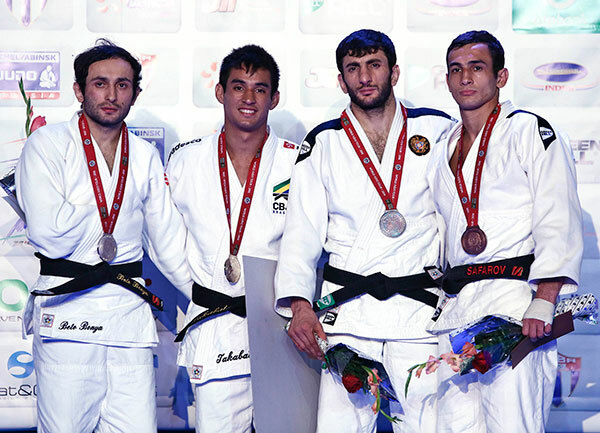 But the Turkish judoka was rapidly injured and had to stop the fight offering the victory to Hovhannes DAVTYAN. The two top seeded athletes of the category, who were defeated earlier during the day, Sharafuddin LUTFILLAEV (UZB) and Orkhan SAFAROV (AZE) were opposed in the second bronze medal contest. LUTFILLAEV took the lead with a first yuko and was controlling the fight when SAFAROV also scored a yuko which was immediately followed on the floor with an immobilisation for ippon. Among the top 8 athletes of the category, five entered the final block of the category, Loïc KORVAL confirming his top seeded position with serious and consistent fights throughout the preliminary rounds. In the final he was opposed to the winner of the first edition of the European Games in Baku last year, Kamal KHAN-MAGOMEDOV (RUS). The first minute and a half went quickly as both athletes were fighting for a good grip in a very dynamic way. After two minutes, KORVAL launched a first strong o-soto-gari, which was immediately counterattacked by the Russian but for no score. Multiplying the small mistakes, KHAN-MAGOMEDOV was penalised twice giving a small advantage to the French. Suddenly, KHAN-MAGOMEDOV could score a first yuko with a sutemi-waza technique. KORVAL was pushing to be able to score as well and he finally did it, but right after the end of the fight, the final gong saving KHAN-MAGOMEDOV’s gold medal. 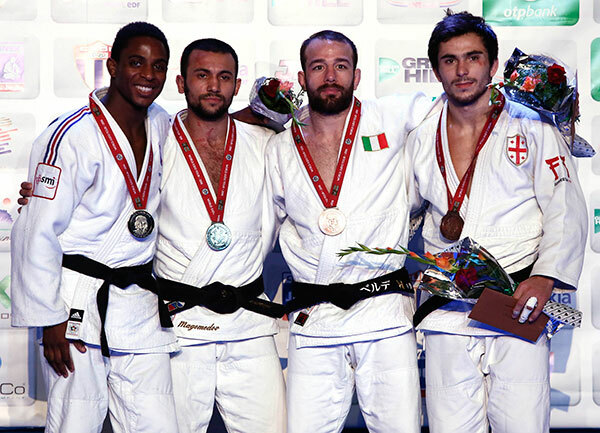 For the first bronze medal, Charles CHIBANA (BRA), winner of the Tyumen Grand Slam in 2014, was opposed to Elio VERDE from Italy. With two shidos on his side, VERDE had to run after CHIBANA for the hope of a medal. He finally succeeded to step onto the podium when he scored a well deserved waza-ari, with a drop seoi-nage. The second bronze medal contest saw Sebastian SEIDL (GER) and Vazha MARGVELASHVILI (GEO) stepping on the tatami for place on the podium. After five minutes, only penalties were distributed: three to SEIDL and only one to MARGVELASHVILI, which gave the victory to the Georgian.